Increasing demand for prime and standby source of power across industrial and commercial applications in India buoyed the integration of diesel generator on rental basis across the country. On account of off-shore areas and unreliable power supply, diesel generator rental solutions have become major source of power for various applications across India. In addition to the residential and commercial applications, high KVA rating diesel generator rental solutions are also used across power utilities, either as a prime or stand by source to power industrial sector especially in the manufacturing sector. According to 6Wresearch, India diesel generator rental market size is projected to grow at a CAGR of over 18% during 2017-23. In terms of market segments, below 100 KVA rating gensets registered majority of the revenue share in the overall India diesel generator rental market share in 2016. Low ownership cost, ease of availability, and higher usage across numerous applications have spurred the demand. During the forecast period, below 100KVA rating genset segment is expected to maintain its market dominance on account of increasing demand across various applications including construction, telecom infrastructure, events and hospitality & healthcare. In terms of market applications, in 2016, construction activities, manufacturing together with power utilities registered higher revenues in India diesel generator rental market. Additionally, during the forecast period, these applications are likely to continue its market dominance attributed to rising construction activities on account of smart cities and infrastructure development across various parts of the country. Some of the key players in India diesel generator rental market include- Perennial, Aggreko, Sudhir Power, Modern Hiring, Perfect hiring, Gmmco, and others. 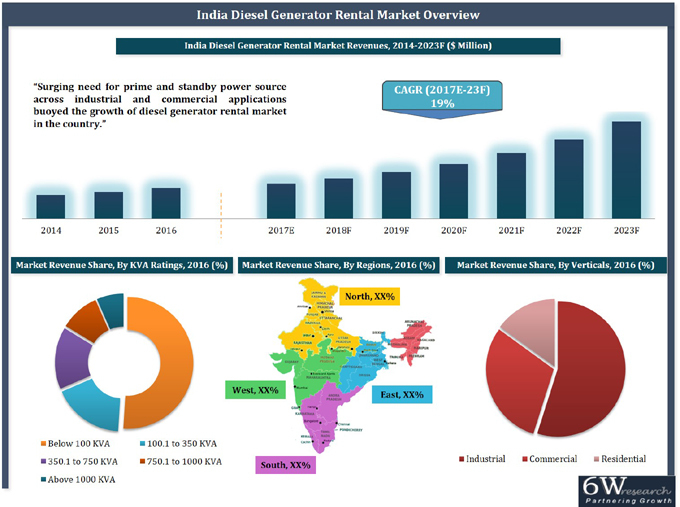 India diesel generator rental market report thoroughly covers the India diesel generator rental market outlook by KVA ratings, market structure, verticals, and regions. India diesel generator rental market report provides an unbiased and detailed analysis of the on-going India diesel generator rental market trends, opportunities/high growth areas, market drivers which would help the stakeholders to device and align their market strategies according to the current and future market dynamics. 13.1	Perennial Technologies Pvt. Ltd.
13.2	Aggreko Energy Rental India Pvt. Ltd.
13.4	Tractors India Pvt. Ltd.
13.5	Marco Gensets Pvt. Ltd.
13.8	Pioneer Power Service Pvt. Ltd.